Tobacco taxes are relatively easy to administer, especially if specific excise taxes are used. Moreover, the volume of money currently collected by taxing tobacco is substantial. In 2013 the World Health Organization (WHO) estimated that Customs and other revenue agencies worldwide collected approximately 300 billion US dollars (USD) annually in tobacco tax revenue. Public health is a second major benefit ensuing from tobacco taxation. This benefit has its basis in the well-established economic principle that higher prices reduce the demand for a product, service, or activity. Economist Paul Samuelson explained that this “downward-sloping demand curve” occurs “when the price of a good is raised (at the same time that all other things are held constant), less of it is demanded.” The WHO Report on the Global Tobacco Epidemic, 2015, which this article reviews, examines the policy of higher tobacco taxes. Public policy can raise the price of bad things and also lower the price of good things. Concerning the former objective, reducing negative externalities (bad things impacting third parties) and negative internalities (bad things impacting the self), governments have at their disposal a number of approaches to raise prices. In particular, taxation is an effective and efficient way to raise the price of bad things and thus reduce their usage. This is, for instance, the leading recommended strategy for mitigating global warming. By raising the carbon price, either with a carbon tax or by emissions trading, carbon pollution will decrease. Concerning this objective, i.e. lowering the price of desired goods, and also in the context of global warming, taxes can be lowered on cars which don’t emit carbon dioxide in order to encourage wider purchases and use of electric vehicles. Another prime policy example of decreasing negative externalities and internalities is tobacco taxation, which raises the price of tobacco products. 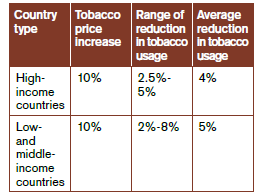 Higher prices reduce tobacco usage, which subsequently lead to a fall in tobacco-induced diseases and premature deaths. This is not to say that taxes are the only influencer on price; for instance, retail sales prices set by tobacco companies can also be an important factor. Following the adoption of higher tobacco taxes, Customs administrations and other revenue agencies are thus contributing to the dual objectives of increased revenue collection and improved public health. There are several types of tobacco taxes, such as excise taxes (specific or ad valorem), Customs import duties, and value-added taxes (VAT), including goods and services taxes, sales taxes, or purchase taxes. Specific excise taxes are assessed based on the quantity or weight of the product, while ad valorem excise taxes are assessed based on the value of the product. Simplicity is a fundamental characteristic for a tax structure to achieve public policy objectives, and this is why tobacco control experts advocate specific excise taxes on tobacco products. 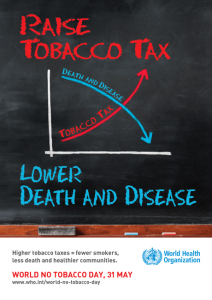 The WHO report, mirroring the WHO FCTC Article 6 Guidelines, supports specific excise taxes as the best way to achieve public health and revenue objectives, particularly because they are easier to administer, and control price movements, when compared with ad valorem excise taxes. One requirement related to specific excise taxes is that they need to be raised periodically to keep up with inflation. For more extensive analysis of the use of excise taxes in tobacco control, the WHO’s 2010 Technical Manual on Tobacco Tax Administration is an excellent primer. Although it may seem obvious, higher tobacco taxes increase the amount of revenue collected. Two of the examples cited in the WHO report illustrate this. In Turkey, the tobacco tax rate rose from 58% to 65% of the retail price – cigarette prices tripled, and revenue from cigarette taxes more than doubled between 2005 and 2011. In South Africa, from 1993 to 2009, total cigarette taxes rose from 32% to 52% of the retail price, and the government enjoyed a nine-fold augmentation in revenue yield from tobacco taxation. As previously mentioned, Turkey increased tobacco taxes while still enjoying higher revenue collection. In addition, between 2008 and 2012, tobacco sales in the country declined by 12% and the prevalence of smoking declined from 31.2% to 27.1%. Tobacco usage and non-usage can be further understood by considering the terms ‘initiation,’ ‘cessation,’ and ‘intensity.’ Higher tobacco taxes can positively impact each of these dynamics. Many people start smoking when they are teenagers; higher tobacco prices deter some young people from ever starting as they are generally more price sensitive, particularly because they have less disposable income. Cessation (quitting) and lowering intensity (a person who reduces the number of cigarettes they smoke but does not quit) can also be positively impacted by higher tobacco taxes, but face the obstacle of overcoming the addictive power of cigarettes. Peer-reviewed evidence shows that higher tobacco taxes do not automatically lead to increased illicit trade in tobacco. The illicit trade in tobacco does, however, correlate to weak, inefficient, or corrupt governance which is why building effective, efficient, and less corrupt Customs administrations is important for collecting revenue as well as supporting public health. One example among many is the United Kingdom (UK). While the nominal price per pack more than doubled from 3.74 British pounds (GBP) in 2000 to 7.13 GBP in 2013, the UK illicit cigarette market share dropped sharply from 21% in 2001 to 9% in 2013. During this period, cigarette usage in the UK declined significantly. This success (higher tobacco taxes, more government revenue, less smoking, and lower illicit trade) was supported by the formulation and implementation of a robust anti-illicit trade in tobacco strategy by UK Customs. In addition to its public health and revenue successes related to tobacco control, Australia is also experiencing lower illicit trade in tobacco. Although seizures are not a perfect proxy for illicit trade, the volume of tonnes of tobacco seized has been declining while the country continues to put similar resources into countering the illicit trade in tobacco. A 2015 peer-reviewed research paper by tobacco control expert Dr. Michelle Scollo and three co-authors states that there is “no evidence in Australia of increased use of two categories of manufactured cigarettes likely to be contraband, no increase in purchase from informal sellers, and no increased use of unbranded illicit ‘chop-chop’ tobacco.” Demand for illicit tobacco products is likely to continue to decrease in Australia. An important question for policymakers is what level to set tobacco taxes. The consensus of tobacco control experts is that tobacco taxes should be raised substantially and quickly to achieve government revenue and public health objectives. 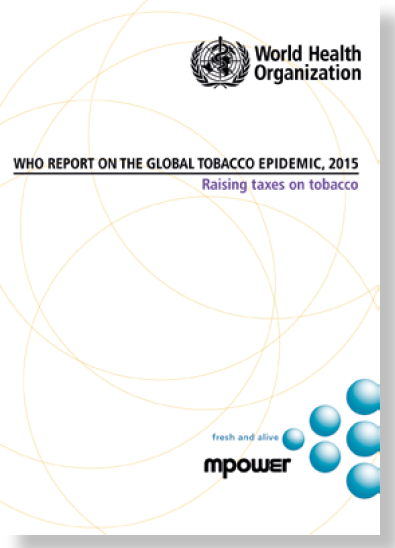 The WHO recommends “that excise taxes should account for at least 70% of the retail price of tobacco products, with continued increases above inflation and income growth after reaching this threshold.” The WHO report states that, as of 2014, 33 countries had managed to raise tobacco taxes to 75% of the retail price. As countries increasingly adhere to the WHO FCTC with higher tobacco taxes, governments will collect more money and facilitate lower tobacco usage. Accordingly, by collecting tobacco taxes, Customs and other revenue agencies are making a vital contribution to human as well as to fiscal health.